This makes me happy. 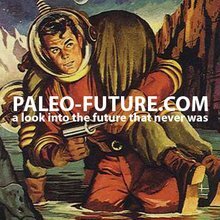 There’s a whole blog, Paleo-Future.Com, that focuses on images of the future that people in the past have held. Lots of Disney stuff, of course, but other very fascinating pictures, videos, and other resources. It is true that the “women” you see in fashion magazines don’t truly exist. Even Cindy Crawford has said “even I don’t wake up looking like Cindy Crawford.” Now you can watch the evolution from reality to fantasy. I had to watch it twice. Families Weight Comments May Harm Girls for Years is the title of the article. This may seem obvious, but I sure wish someone had pointed that out to my parents. You know, diet programs at age eleven are 1) never a very good idea and 2) really hard on one’s self esteem, not to mention waistline. I have heard that kids will self-regulate their eating quite unselfconsciously. Thus, if one presents healthy options — both for eating and excercise — that should be all the “commentary” necessary. Good article from the New York times about ritual and fashion at a gay wedding between a former seminarian and a former monk, complete with huppah. Good read.